Enter a world of color, culture, and cherished spiritual tradition of India and Nepal. Your guided tour of India, Nepal, and Ganges River cruise begins in the bustling city of Delhi. You’ll tour the city with your expert local guide, and take a rickshaw ride through the Chandni Chowk bazaar—brimming with everything from silver and spices to saris of every color. You’ll visit Qutub Minar—the world’s largest brick minaret, and see Delhi’s largest Sikh gurudwara (house of worship), before traveling to Agra—site of the legendary Taj Mahal. In Kathmandu, sightseeing is spread over two leisurely days. Visits include Hanuman Dhoka, a UNESCO World Heritage Site, and the Temple of Kumari, residence of the Living Goddess, a child thought to be the reincarnation of a Hindu goddess. You’ll also journey to Patan and Bouddhanath, Nepal’s largest stupa. 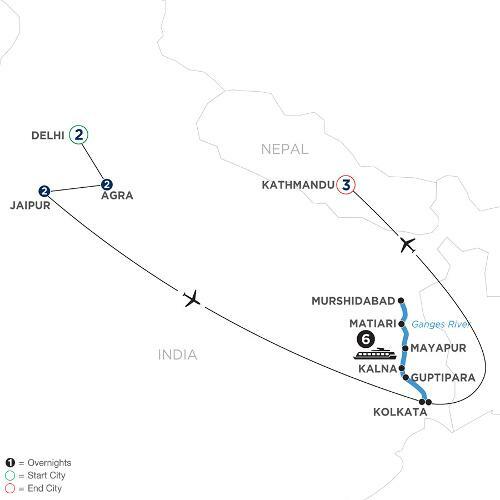 All of this and more await you on this once-in-a-lifetime guided tour of India and Nepal with a Ganges River cruise. Participation in this vacation requires purchase of the following flights from Avalon Waterways, not included in pricing: (1) roundtrip air from your U.S. gateway and intra-vacation air segments; or (2) intra-vacation air segments only, starting at $344. Required intra-vacation air segment: Agra/Jaipur; Jaipur/Kolkata; Kolkata/Kathmandu. Air prices were effective on February 6, 2019 and their availability is limited. At the time you purchase your tour, air prices may be higher.